Editor’s Note: Keegan Garrity is guru of all things retro. Music, movies, clothing styles. If it’s from the 80s or early 90s Keegan could talk to you about it for hours. We couldn’t have got a better, more knowledgeable person to write our new feature called “Back to the Feature.” Get ready to travel back in time with Keegan as him and Doc Brown gas up the DeLorean to bring you reviews and commentary about retro movies. The year was 1986. Mike Tyson became the youngest heavyweight champion of the world, the Chernobyl nuclear power plant exploded leaving the land desolate to this day, and The Nintendo Entertainment System arrived in the U.S. 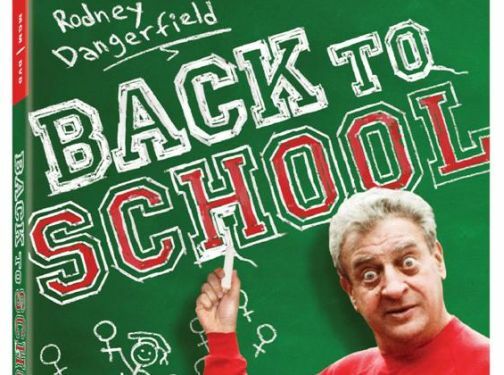 This same year, at the apex of his career, Rodney Dangerfield starred in arguably his best film role, Back to School. As students across the nation return to campus, I could not think of a more appropriate pick for this month’s retro review. Thornton Mellon (Dangerfield) is a self-made millionaire who built his empire from a chain of “Tall and Fat” clothing stores. Although Thornton never went to college himself, he supports his son in pursuing an education at Grand Lakes University. During a surprise visit to campus, Thornton learns Jason wants to withdraw. In an effort to provide a paternal example, Thornton decides to enroll himself and go back to school. Who better than Dangerfield to play the role of an obnoxious class clown? Harold Ramis (Groundhog Day, Caddyshack, Analyze This) leaves enough room in the script for Dangerfield to deliver the best one-liners you’ve heard since the late Mitch Hedberg began doing stand-up. Attending class with the characters gives you a glimpse of a college experience, albeit a satirical one. You will see how textbook theories stand up against real-world experience and observe professors using their classroom as a political forum. Fans with a more subtle, snarky sense of humor will appreciate this style of comedy. As the story progresses, through the influence of his father and his non-conformist pal, Derek (Robert Downey, Jr.), Jason learns the lighter side of being an undergrad. His father on the other hand, learns school is not all fun and games when his antagonist, the snooty Dr. Phillip Barbay (Paxton Whitehead) reports his questionable behavior to Dean Martin (Ned Beatty). Thornton is ordered to take a comprehensive oral exam to evaluate the authenticity of his homework and test scores.